Donald Trump’s face locked in a ghastly scream; Italian politicians gripped by the octopus tentacles of the Mafia; Kim Jong-un as a giant baby, throwing a tantrum over a bomb. If you thought Carnival was all about dancing, headdresses and costumes made to be as scanty as possible, brace yourself for Viareggio. Trump, Kim and those octopus politicians are what you’d have found if you’d gone for the 2018 edition of the carnival on the Versilia coastline, north of Pisa; but the first time I went, it was 2006. I was expecting an array of papier-mâché giants tacked on to bog-standard floats, with as little symbolism as the Macy’s Thanksgiving Parade. Instead, I was thrust into unremitting satire: Blair, Bush and the G8 leaders as marionettes operated by faceless forces of capitalism; Berlusconi as a shifty circus showman. At 40ft, the figures were as big as the Art Nouveau mansions they processed past, waving arms, spinning heads and erupting in giant grins. It was like walking onto the set of Spitting Image. “Il Carnevale è di tutti e per tutti,” read the mission statement – carnival is everyone’s and is for everyone. Today’s biting satire is a far cry from the Viareggio carnival’s origins, when, in 1873, the local gentry decided to start a parade. They got their fancy floats built in the boatyards that formed the central economy of this coastal town. Perhaps it was coincidence, perhaps it was the workers’ influence, but 14 years later, the brief had changed. By now, carnival was all about making fun of those in power. From there, the carnival went from strength to strength. In 1925, they started making the floats out of papier-mâché instead of wood – allowing the figures to move, like the giant robed skeleton that skimmed the seafront on my visit, spinning a carousel with unwitting children on it. Today, preparing a float is a year-round job. Every September, the artists – who otherwise work on theatre sets and cruise ships – decide what they’ll debut the following February. Over the next five months, the floats are constructed, piece by piece, in aircraft hangars in the Città del Carnevale, outside the town centre. They get just five outings – set loose to roam the streets for four consecutive Sundays before Lent, as well as Shrove Tuesday. Once Carnival is over, they’re put back in the hangars, in case they can be sold or loaned to an exhibition. When September rolls around again, they’re destroyed – the hangars are needed for the next bout of satire. Not that it’s all so heavy. The floats are accompanied by more traditional parades of musicians and costumed marchers, interacting with the crowd; tinny pop music blares out from each and every segment. And Viareggio itself is a delight – an astonishingly well-preserved Belle Époque beach resort, with elegant Art Nouveau buildings on the main seafront boulevard squaring off against Art Deco bagni, or beach clubs. The beach is one of Italy’s best-known – a never-ending strip of yellow primped to within an inch of its life, with carefully raked sand and smart deckchairs arranged in strict lines. For 2019, nine main floats have been announced, and they’re as political as ever. With its flying birds carrying Italian-branded suitcases, “Bel Paese Vola Via” (“The Bel Paese flies off”) will depict the exodus of Italy’s educated youth. “Inquinamente” or “Mental Pollution” will show the detrimental effect social media has on our psychology – including a mini, tweeting Trump. And “Sono Tornato”, or “I’m Back”, will parallel Deputy Prime Minister Matteo Salvini with Mussolini. Not that you need to recognise the faces to get the gist of what the floats are telling you. I didn’t know much about Jose Zapatero, the Prime Minister of Spain in 2006; but I knew from the way the 30ft bull was bucking, desperately trying to throw him off, that he wasn’t liked. In 2019, Salvini and Mussolini will be riding a tyrannosaurus rex. This carnival has come a long way since 1873. 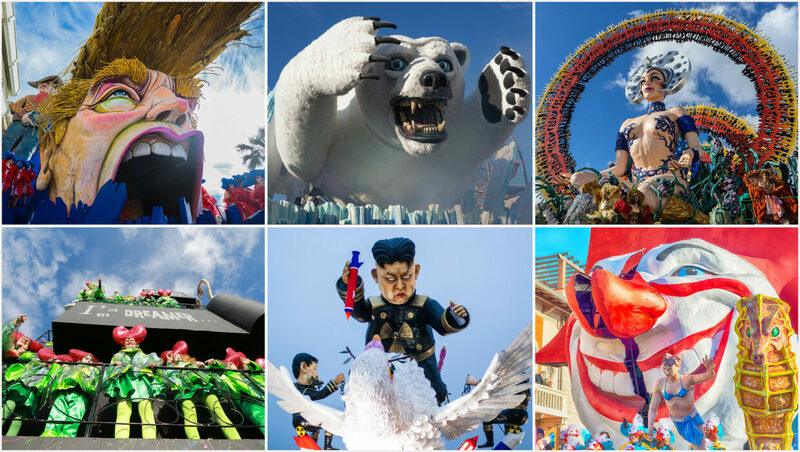 Viareggio Carnival takes place from 9 February in 2019. To Tuscany has a fantastic choice of villas near Viareggio.